Our Small Double Bed & Mattress Combo offer great deals on style and comfort. Choose from divan to leather or fabric bed frames with a quality mattress to cater for your comfort and sleep requirements. Buy a Small Double Bed & Mattress Combo from Bigmickey.ie and enjoy the perfect night’s sleep you’ve always dreamed of. The Best Rest Raz Semi-Ortho Set is our biggest selling quality mattress and base is the Best Rest Raz Semi Orthopaedic set. 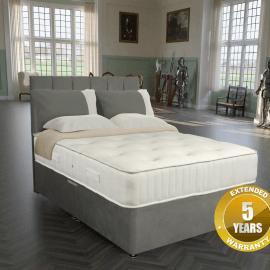 With its open coil sprung, medium tension, double-sided turntable tufted mattress and soft touch topper it boasts an amazing five-year warranty. The Buddy Bed and Mattress Set includes a divan base and mattress. The Irish Beds Marlborough bed set includes a matching platform top divan base and mattress. The Marlborough Open Coil Mattress features a 13.5 gauge open coil spring unit with generous layers of polyester fillings to both the top and bottom of the mattress. 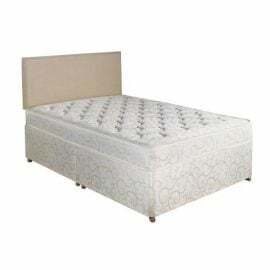 The Mattress is Deep quilted and features Damask fabric. 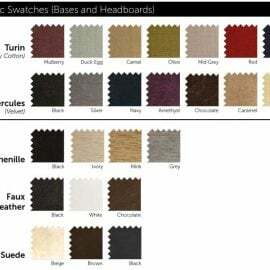 The Prado Leather Bed and Mattress Set is available in black or brown Faux Leather and is exceptional value for money.